Framed by lilac bushes and climbing ivy, the charm of yesteryear lives on in this little stone cottage. 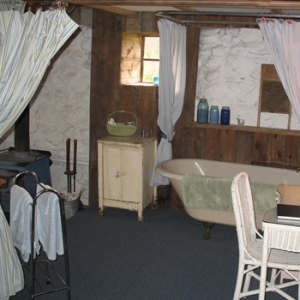 Filled with cottage antiques and a clawfoot tub, our guests will slumber in the privacy of a sleeping loft with a king-size bed. 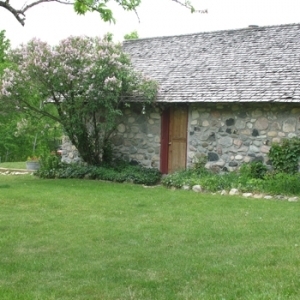 Enjoy a good book on the daybed covered in puffy pillows, crank-up the woodstove on a chilly evening, or relax on your private patio overlooking the Leelanau countryside. 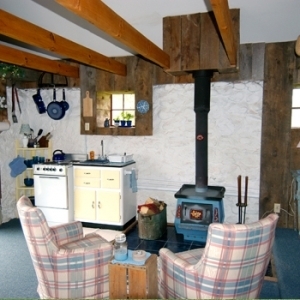 The stone cottage features a small kitchen area filled with all your cooking needs: a refrigerator, coffee maker, microwave and toaster, electric range and oven. 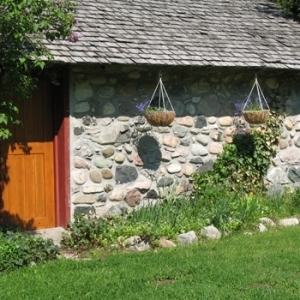 The stone cottage also has an outdoor grill for summer cookouts. Relaxation and sweet dreams await!